Take a little folk art kitsch on the road with one of my Loteria flasks featuring vintage Mexicana images from the 1940s. A great gift for any lover of retro, rockabilly or Spanish kitsch culture. 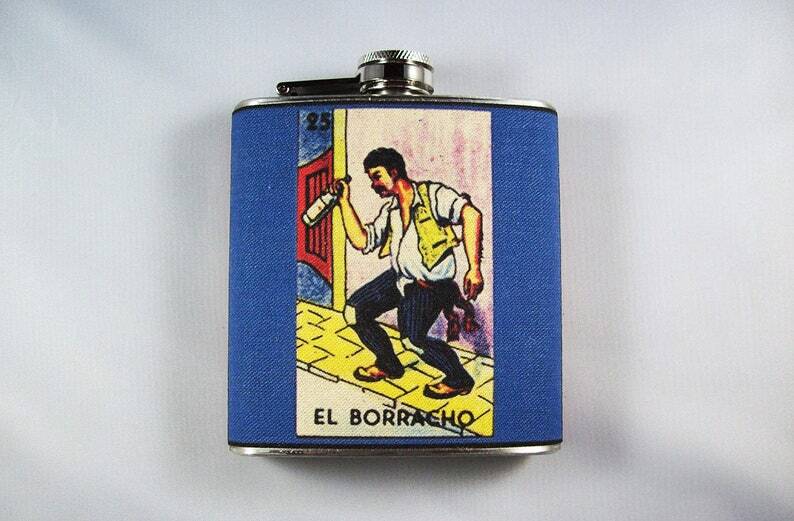 I can make these flasks any of the many Loteria images and have shown some of the more popular ones in the photos. You may choose from them or create your own combo (the flasks have images on both sides so you can mix and match as you will). I make these babies with a brand new 6 oz stainless steel flask. I start by transferring the image onto lightweight canvas. I then apply 3 coats of scotch guard and adhere the canvas to the flask. The final result is a water and stain resistant product that will hold many a drink for your travels. I do make these to order so it will be a few days after purchase before I can ship. Arrived quickly and in a neat package that made me laugh! Looks very well made, and the colors are great.